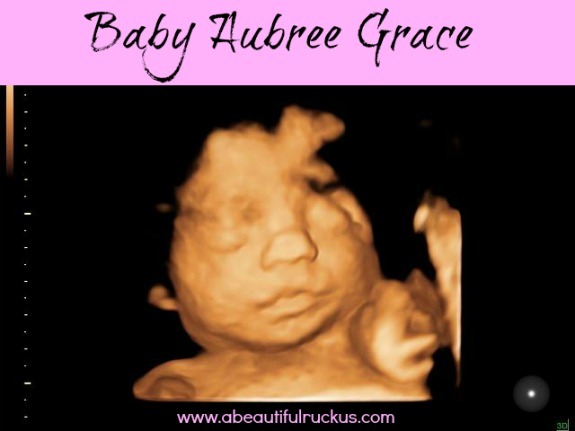 It has been a really rough week for our extended family as we've started grieving the loss of Aubree. Sarah gave birth to Aubree on Tuesday morning, with her husband (my brother) Mike by her side. They very graciously invited both sides of their family to meet Aubree, and even let me hold her for a brief minute. She was so beautiful and peaceful in her little dress and wrapped in her pink and white blanket. If was very difficult to see my brother and dear friend that day as they said "hello" and "goodbye" to their daughter at the same time. Since many of you have been following their story, I thought I'd pass on this link to you. Sarah wrote a beautiful post called, "A Birthday Story," about the days leading up to and the delivery of Baby Aubree. It has been amazing to watch my brother and sister-in-law walk this path over the last couple of months. In spite of Aubree's fatal diagnosis and repeated suggestions of the doctors to terminate the pregnancy, Mike and Sarah chose instead to trust God through the pain, knowing that she would most likely pass away. It has been humbling and inspiring to watch their faith in such a vivid and raw way, while still doing everything they could do to help her. I've had several readers ask about them and what they can do to help. I always find the community here so encouraging and loving. Through our pregnancy and now through Mike and Sarah's, I don't know what I would do without all of you on the other side of the computer, and the constant prayers that I know you are sending up for my immediate and extended family. In an effort to help Aubree, Mike and Sarah have amassed some enormous medical bills. They saw specialists on a weekly basis, had countless tests and ultrasounds, and sent Aubree's medical records to expert pediatric cardiologists around the country. They tried every avenue available to them to find some way to help her. They didn't want us to, but we begged and finally convinced them to let us help raise some funds to offset their medical bills. As they continue grieving, we want to remove the stress of finances so that they can focus on healing. If you are wanting to help them, a fundraiser has been set up as a memorial for Baby Aubree. Everything collected through the fundraiser will be given to Mike and Sarah for medical bills. If you would like to help, you can go HERE to donate. Thank you for bearing with me on a rather odd week here on the blog. I just haven't felt much like writing, and I'm grateful that I had a few posts in the queue. We should be back to our regular posting schedule next week. Thanks for understanding and for praying! Rebecca, my heart goes out to your entire family. Only Jesus can carry you all through this. Thank you for the link to Sarah's blog. It is beautiful and so encouraging to see how she is endeavoring to carry her heart without offense through this most difficult trial. Prayers for you all. Aubree is beautiful and she is with Jesus. May you feel His comfort and peace right now. Oh, I'm so sorry to hear about this, but I'm so glad that they (and your family) got the chance to hold her and love on her. Prayers go out to all of you. Rebecca, my deepest condolences. Thank you for passing on the information about the fundraiser. Aubree's story and the incredible love and faith of your family has touched me in ways I did not expect - we want to help. My love and prayers to all of you. This is a hard time in your family's life, but GOD is always in control. He loves us all. I will pray for your family during this time. May GOD's grace and love keep you. I had been praying for Sarah and Aubree, and the entire family for a miracle to happen and for you all to be able to meet Aubree. I know God had a plan that we may not understand and I pray for Him to heal your hearts and wrap you all in His arms in this very diffucult time. I will continue to pray for everyone. I am so sorry for the loss of a beautiful angel. I hope that your brother and sister-in-law find peace and hope though Jesus. God has a plan and I am thankful for you sharing this story.